We have all been there. Food just sitting in the fridge. Buying vegetables with good intentions only to bring them home to die. I’m just as guilty as the next person. Next to the pantry the fridge is the most cluttered place in your kitchen. There are several reasons why the fridge becomes a place of cluttered confusion and funky food. The first is that many people head to the store before they even take stock of what they already have. Another reason is that although we all want to eat right and eat fresh, unless you are going to make it that night the chance of things going bad are pretty good. So since November is clean out your refrigerator month I wanted to give you a few tips for getting your refrigerator back into shape and smell free. Always clean out your fridge before you go shopping. Purge old items, take stock of what you already have and what you need. Just like you clean your house every week make it a point to clean the fridge every week. Especially if you don’t go to the store every week. That way you can stay on top of expiring foods. Check your temperature settings on your fridge. Make sure that everything is set at what is optimal. If you find food spoiling fast or water leaking you may need to adjust the temperature. Deep clean your fridge monthly. Take everything out of the fridge. Clean off the bottles and the jugs and cans. Clean the shelves with soap and water. Wipe down the outside of the fridge. Clean the inside door and drawers and other hidden spaces that usually don’t get attention. Once everything is sparkling, put your food back. Group like items together. Just like you do with organizing your kitchen cabinets and organizing your home the same concept applies to your refrigerator. Have zones in your fridge. Like all condiments together; meats, veggies, etc. Don’t forget your freezer! The freezer is easy to overlook. It’s easy to just throw things in there and forget about it. You need to clean and evaluate what is in your freezer just like you do the fridge. Just because you can freeze things for long periods of time does not mean that things don’t go bad and that it can stay in there forever. 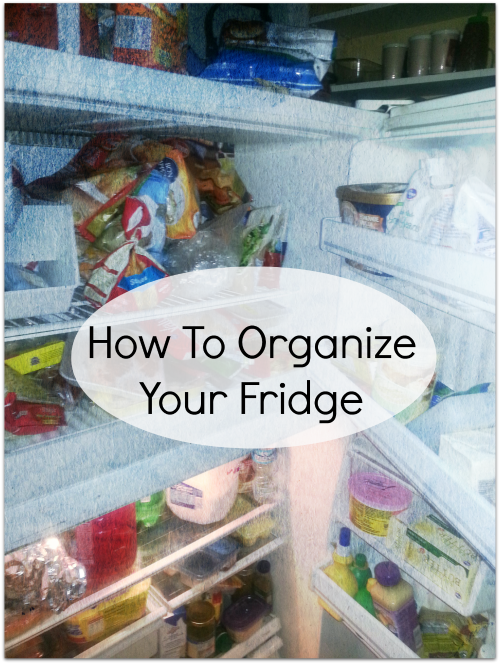 You need to at least monthly if not more purge your freezer. Throw out freezer burned food. Throw away food that you know you are not going to eat because you keep passing over it. Throw out food that has been in there over a year. Make space for food that you are actually going to eat. The key to keeping your fridge and freezer organized is planning. Make sure to buy only those things that you know you and your family are going to eat. Don’t go buy things on impulse. Make a list before you go to the store and stick to it. Shop more frequently and get less stuff. Shop for just a weeks worth of food and you won’t have to worry about things spoiling. I know it will be hard at first, but if you just keep at it you will form a routine and your fridge will be in great shape. I’m the type of person that it is hard to plan meals for because my taste change every day, but to combat that I just plan and buy food for a variety of things that I can eat that week and know that I will eat that week. Planning is key.